Jona ch'Ranni had the most liked content! Thanks, @Theo Whittaker! Glad you enjoyed it, mon capitaine! Thanks @Pholin Duyzer glad you enjoyed it. I wanted to capture those crazy out-of-control worries that all of us experience from time to time. In Gmail on the left sidebar if you click the More option below Inbox it will expand the menu out. You can select All Mail and it will show every item (ones you have received and sent both). I use this to gauge where my last email falls in relation to ones I have received since then. The turbolift spat Cadet Jona ch'Ranni out into the spacious corridor of the Starbase 118 Promenade. He stumbled as his boot caught the lip of the doorway and he fell to the gray carpeted deck in an undignified heap. A passing Trill offered a kind hand to help him to his feet. He thanked her and it took all of his self-control not to gawk at the variety of sights and sounds that assaulted his senses. Bustling was the word he would use to describe the place. Hundreds of individuals milled along the path which spread out in both directions as far as the cadet's keen eyesight could see. His antennae twitched and swiveled independently, trying to take in the bright colors and constant hum of sounds that permeated the area. Jona turned to the left and merged into the crowd of people that flowed like a river down the hallway. Jona's light blue skin beaded with sweat as he walked. The heat from the press of people around him warmed him more than was comfortable for an Andorian who was acclimated to the arctic temperature of his home world. The fresh cadet, all of 24 years old, exited the crowd and found solace in the slightly cooler pub that he entered. It was called Keal's Pub and sported a rustic decor that appealed to Jona. He took a seat on one of the wooden stools at the bar. 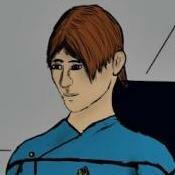 He nodded to a fellow Andorian, a strikingly beautiful woman, across the room. She inclined her head back to him with a slight smile. Jona was lost in thought as he turned back to the bar and was startled by a man standing in front of him across the countertop. "You'll have a Samarian Sunset, I suppose?" said the middle-aged man with a smile. "Yes, that's my favorite drink," replied Jona. "How did you know?" "Betazoid," answered the man. "Makes my job pretty easy when I know what you want to order before you order it." He slipped the cadet a squat glass with a clear liquid inside. Jona tapped the glass and the drink swirled orange and gold. Just like he liked it. "Thanks. I appreciate it," said Jonah. "What can you tell me about this place?" "It's an amazing port," said the dark-eyed man. "There are wonders here that you have never imagined. Yet it's as familiar as home. You'll see. One thing that it's not is ... boring. Never boring." The man's description trailed off as he stared forward as if whole sections of his life were playing out before him. This man had seen some things - not all of them pleasant but not all bad either. He just had an air of someone who had lived life and survived to tell about it. It reminded Jona that he had not lived much life beyond his youth and the few short years he spent at the Academy. He had spent more time in simulators and sitting in classrooms than actually living life. He was eager to add to his list of experiences, though, and this Starbase was going to be the epicenter of it all. Jona tugged at the mustard yellow collar of his uniform. It was perfectly tailored to fit his slim body down to the micron but it wasn't a mistake in sizing that caused the nervous habit. His classmates loved to tease him about this - they called it the 'Jona Maneuver' much to his embarrassment. A chime from his PADD reminded him of his upcoming appointment. He was to report to the Holodeck for training at 0900 hours. Just ten minutes from now. Better to be early than late. He thanked the bartender and downed his drink, setting it down with a plink. The cadet stood and stretched his limbs, loosening his muscles. He pictured his narrow fingers flying across the helm console, banking the starship as disruptor fire zipped past the nose of the ship. "All hands, brace for evasive maneuvers," he whispered to himself. Yes, he was about to rack up some experience. He was ready for anything.